Didn't realise how bad my old battery was. Put this on and I realised I'd been pushing my trolley round for last 5 holes. Brilliant. Tried on 18 holes worked ok. I'm hoping it does 36 but not tried that yet. Great fast service , does the job, good price. Livraison rapide, le produit correspond à ce que je souhaitais. After an initial enquiry re. suitability (which was very promptly answered), I ordered the battery. The shipping was ultra efficient, very quick and delivered as promised, the communication was also first class. 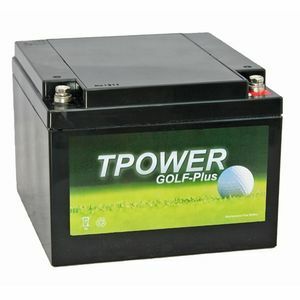 I use the battery on a golf trolley converted to power a fishing tackle cart, which when loaded is far heavier than the usual golf equipment. To date I have used the powered cart three times.over a variety of terrain, maximum 800yards to, and 800yards return with great success. The battery has performed very well, powering the cart , holding charge and re-charging after use in approx. one hour.....All in all delighted with my purchase.